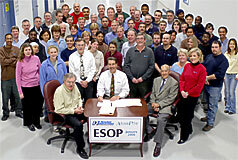 ESOP - WE ARE EMPLOYEE OWNED! NewAge Industries established its ESOP – Employee Stock Ownership Plan – in January 2006, when CEO Ken Baker sold 30% of the company to the employees as a way to ensure the company’s continuation. The ESOP added a new facet to the company's culture, namely the pride of ownership, while it discouraged a buyout from a competitor or other business. It’s another feature of the company's retirement benefits that include a pension plan and 401(k) plan. In January of 2013, Baker sold an additional 10% to the employees, bringing employee ownership to a 40% share. ESOP ownership was increased to 49% in 2016, and in 2019 NewAge will become 100% employee owned. Since the inception of the ESOP, NewAge has continued to grow and prosper. Demand for its high purity products, marketed under the AdvantaPure® name, has experienced tremendous growth, and its standard products have also seen a substantial increase in sales. This success and the satisfaction of employee ownership has a real and beneficial effect on the morale, attitude, and future retirement of NewAge Industries' employee-owners. NewAge built its solid reputation by providing a high level of customer support and service, along with superior products, and the AdvantaPure division has earned a similar standing. The establishment of the ESOP lets employees expand upon that by allowing them to take true ownership of their positions. Baker says "When a customer calls, they speak with an owner. The employees' jobs are part of an investment in their future, and that's reflected in their communications with customers and suppliers, and with each other, now more than ever." Another customer benefit resulting from the ESOP is that it sets up a succession plan for the organization. Many of today's international conglomerates become larger by acquiring small companies. Plants are often closed, and production is moved offshore. The knowledge and talent of those employees is lost as they find jobs in other industries. Baker wanted to avoid that possibility and, at the same time, help secure a future for NewAge, AdvantaPure, and its employees. 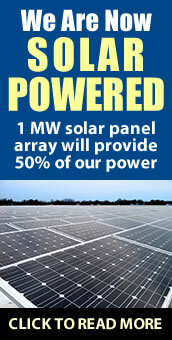 NewAge Industries is an employee owned company that is a great place to work. Check out the video below to get a feel for how employee ownership inluences our company culture. Check out this article from Forbes magazine that features our company. Pennsylvania State Senator Stewart Greenleaf recently hosted a Town Hall Meeting at our facility to discuss the company's ESOP in which several of our team members participated. The Senator's office produced a video of the meeting for his website. You can watch highlights below. ESCA is the voice in Washington, DC that speaks exclusively for employee-owned S corporations ("S ESOPs"). Since 1998, ESCA's membership has grown to represent more than 140,000 employee-owners in virtually every state in the nation. ESCA company members engage in a broad spectrum of business activities and are a variety of sizes – from 25-person businesses to companies with 9,000+ employee-owners – but all have one thing in common: a commitment to preserving the S corporation ESOP structure and expanding it so that more working Americans can become employee-owners. The National Center for Employee Ownership (NCEO) is a self-sustaining nonprofit membership organization that provides practical resources and objective, reliable information on employee stock ownership plans (ESOPs), equity compensation plans, and ownership culture. They are the main publisher and research source in the field, hold dozens of Webinars and in-person meetings annually, and provide services to thousands of members and others. "This has been a goal for a number of years," says CEO and majority share owner Ken Baker, "and I'm glad the plan has now become reality. 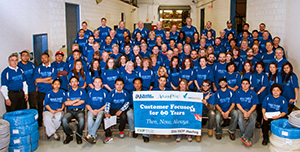 Making the employees part owners is a big benefit to our customers, as well as the employees."